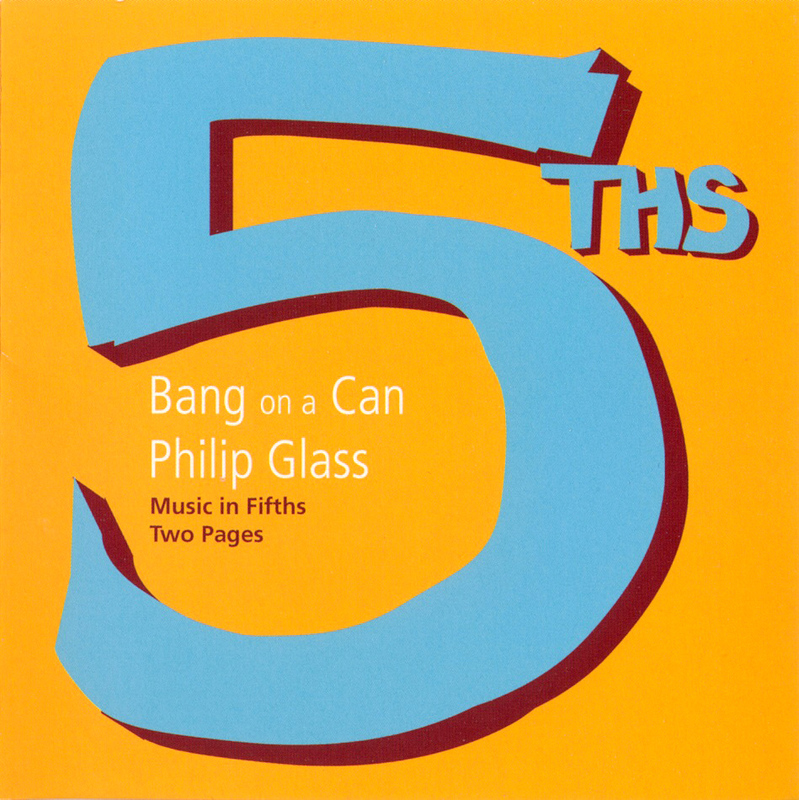 Cantaloupe continues its recording series of the masterworks of the music of our time with this brilliant disc of two early classics by composer Philip Glass, performed by the Bang on a Can All-Stars. Glass is arguably minimalism's most well-known and influential composer. Before film soundtracks, operas, and universal acclaim, there were these intense, rugged, and demanding early works for keyboard. In Music in Fifths and Two Pages, Philip Glass's ideas are at their most basic, using only addition and subtraction of notes in simple scales to create epic and hypnotic musical forms. The Bang on a Can All-Stars reconceive these works for their ground-breaking sound of clarinet, cello, bass, piano, marimba, and electric guitar. 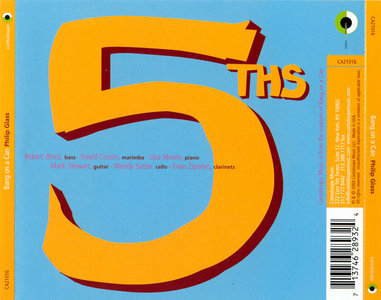 In the tradition of their award winning recording of Terry Riley's In C (#1 CD of 2001 by both the New York Times and the Washington Post), the musicality, passion, and focus of the All-Stars, plus the sparkling sound quality of the recording, catapult these classic works into the 21st century. Music in Fifths (1969) is in "closed form" - a predetermined structure that ends when the accumulation of repetitions fill it out completely. Glass has always considered Music in Fifths a sort of teasing homage to [legendary pedagogue Nadia] Boulanger; it is written entirely in parallel fifths, a cardinal sin in the traditional counterpoint his teacher so carefully instructed. Two Pages was written in 1967 or 1968. In this study in the elongation and subsequent contraction of a simple musical line, Glass explored what he called his technique of "additive process," derived from his work with Shankar, in its most skeletal manifestation. 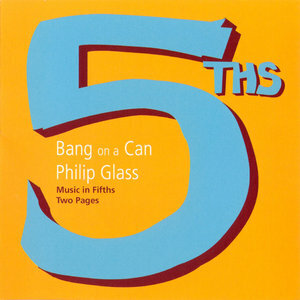 Fans of Bang on a Can and Philip Glass may grab "5ths" impulsively, but all others should approach this disc with caution. Music in Fifths and Two Pages may be classic Glass works, from 1969 and 1968, respectively, and their place in the development of his style of minimalist music is undeniable. However, Music in Fifths is austere and edgy, and the emphasis on tight ensemble playing in parallel fifths puts a premium on the group's physical stamina. But the music is relentless and tiring after the first few minutes. The rapid, repetitive melody in organum voicing changes slightly over the course of 24 minutes, but only the most persevering listener will be able to detect the subtle rhythmic shifting. Two Pages may offer a change of color and texture, but the relief is brief indeed, for this piece runs on its narrow pitch material for 27 minutes, without significant changes other than the shortening or elongation of cycles. These pieces are among Glass' most severe works, and come well before the comparatively lush pattern pieces of the late '70s and the neo-Romantic scores of the 1980s. Before playing this disc, turn the volume to a safe mid-level, because the recording is alarmingly hot. This is a wonderful recording with committed performances of transcriptions of two early Glass works ("Fifths" and "Two Pages"). 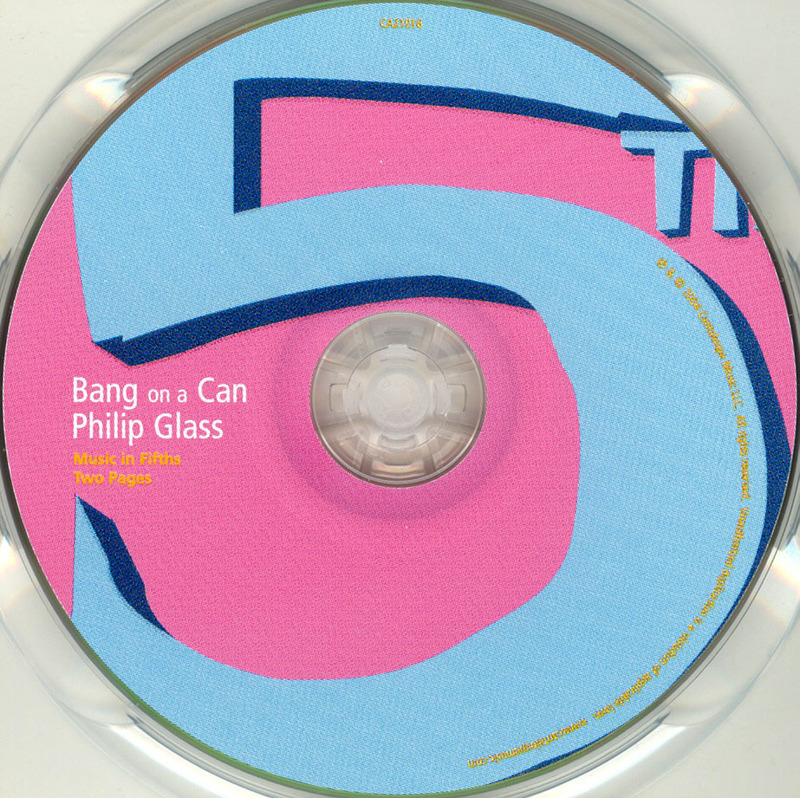 Curiously the CD label and Bang on a Can's web site do not credit the transcriber(s) but I believe that it was done by the talented musicians of the Bang on a Can collective. The disc is not yet listed on Glass' official web site. Fifths was originally performed and recorded by Philip Glass with Jon Gibson and Dickie Landry in the original version for saxophones and electric organ. Two pages was done by Philip Glass on electric organ and Michael Riesman on piano. It is these versions that I first heard and loved. By contrast the BOAC version has a somewhat softer quality as compared with the "in your face" quality of the original recordings. But this is not a criticism of either. It just seems that contemporary recordings of Glass' earlier works tend to be done in a more genteel fashion (such as the Nonesuch recording of Music in Twelve Parts) which is perhaps more easily consumed by a larger audience. There is some loss of the intensity of the earlier versions but the performances are good, legitimate interpretations that any Glass fan needs to have and a wider audience should experience. This is good music, groundbreaking at its time and still vital now. I look forward to BOAC (hopefully)recording other early Glass compositions such as Music in Similar Motion (ably done by the Italian "Alter Ego" ensemble on the Stradivarius label) and the keyboard piece Contrary Motion. This ensemble is doing a great service to contemporary music and aficionados would do well to become familiar with their work.